Weekly Innovation: A Better Travel Neck Pillow : All Tech Considered It's called the Nap Anywhere, and the doctor who invented it promises it's far more comfortable — and easier to pack — than the standard inflatable U-shaped travel pillow you know well. 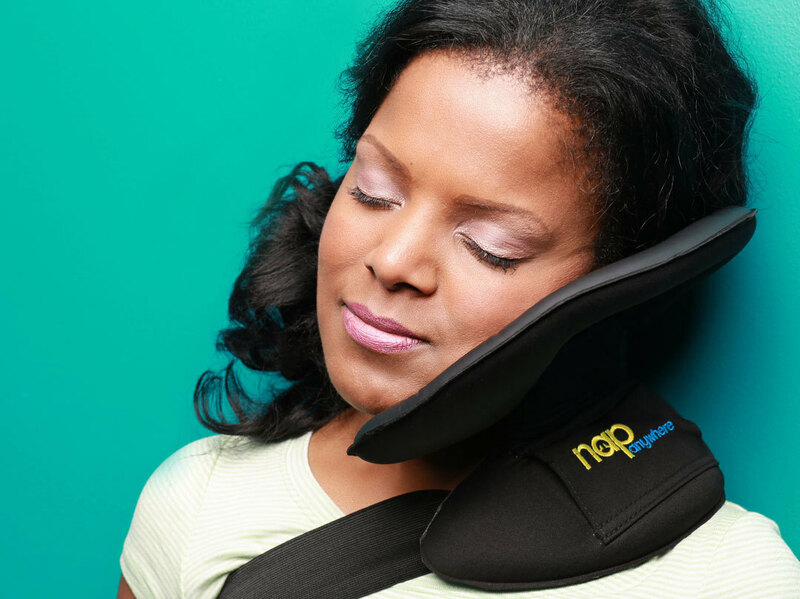 The Nap Anywhere is a new, portable head-support pillow created by a Virginia-based physician. The familiar U-shaped inflatable travel pillow just wasn't doing it for Ravi Shamaiengar. The Virginia-based doctor is a frequent business traveler, and after years of thinking that the standard travel pillow was a hassle that left his neck sore, he took matters into his own hands and tinkered his way to an invention: The Nap Anywhere. The radiologist and health journal publisher turned inventor says he's been working on the design for years in his garage, in his spare time. "I made the template out of chicken wire and it worked better than anything I'd used before," Shamaiengar tells NPR. "I had to figure out how to construct it, so I hired an engineering company, and two years later, I launched my project." In 2012, the Nap Anywhere made its debut at the Virginia Inventors Forum and took home the top prize of Innovation of the Year. The win inspired the doctor to start a campaign on crowd-funding platform Kickstarter last month. The effort to raise $40,000 to start manufacturing the Nap Anywhere exceeded its goal, and the doctor says a factory will start making the first batch of these foam pillows — about 3,000 of them — by September. About half of those will go to the Kickstarter backers of the project. The rest will be available to order, starting at $49, on the Nap Anywhere site in a few weeks. While we think this would be a perfect product to market on the kitschy in-flight catalog SkyMall, Shamaiengar hasn't thought that far ahead. "I'm not a typical entrepreneur," he says. "This device I made for me. I didn't really have any aspiration to make it for other people. But after I made it, people who saw it said, 'This thing is so awesome, you should make it for others.' Now this will probably help more people than I help as a physician. This might be the biggest accomplishment I will have."